Dan and Lou's commitment to alternative mobility derives from their experience as parents. In 1981, their elder daughter Ruth was diagnosed as having Spinal Muscular Atrophy, a neuromuscular condition which in Ruth's case caused serious muscular weakness from the age of about 6 months, and continues to prevent her from walking unaided, or even crawling or rolling over when lying down. For more information on SMA there is an excellent national charity, The Jennifer Trust for Spinal Muscular Atrophy supporting families and fundraising for research into this condition. As the medical advice was that this was a purely physical disability, Dan and Lou were determined to help Ruth to make the most of her intellectual abilities and socialise in a normal way with able-bodied children. They realized instinctively that this would mean making her mobile somehow. The doctor who diagnosed her condition set the seed in Dan's mind by saying she would "need wheels". At that time, there was nothing available for children under school age, and Ruth was only seventeen months old. Dan set about using his engineering skills and contacts to make her a powerchair from which she could reach as many surfaces as possible, from floor level to highchair height, and in which she could play with ablebodied children. This he achieved with help from Cambridge Consultants Ltd, for whom he had worked as a design engineer at the beginning of his career. Within ten weeks, Ruth was testing the unclad chassis of the chair which later became known affectionately as the "Yellow Peril". Ruth was independently mobile from the age of 22 months. 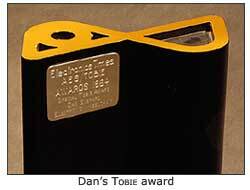 In 1984 Dan was awarded a special TOBIE award by the Electronics Times for this design. Other families saw Ruth in her chair and asked where they could get one for their children. This led to the formation of Everaids Ltd and the design of the Turbo. 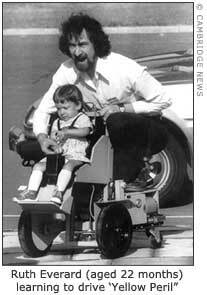 When it came on the market in 1984, the Turbo was the pioneering form of indoor-outdoor powered mobility for very young children, with elevating seat, simple programmable controls, and the option of standing to drive. It was designed for use by children from 12 months of age, to allow them to play and participate in normal life as actively as possible. It has given hundreds of children with disabilities across the world the early independence necessary to develop social skills and a positive attitude to themselves and their abilities. Many have been able to integrate more easily into mainstream schools, higher education and the workplace, because of the access and wider life experience their Turbo has given them. Other older, more severely affected children managed a powerchair for the very first time because of the individual care given to seating, programming and special controls by the Everaids team. 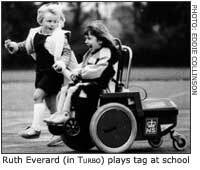 The Turbo was the stimulus to the founding of one of the foremost UK charitable providers of children's wheelchairs, Whizz-Kidz, in 1990. Whizz-Kidz has since grown in influence and has been wonderfully successful in promoting the benefits of childhood mobility which the Turbo and other children's chairs provide. Commercially, the Turbo helped stimulate a range of other designs for children, where none had existed before, and influenced wheelchair design for adults, too, encouraging use of different colours and styling, raising awareness of seating needs and raising expectations amongst disabled people and their families as to what quality of independent mobilitywas possible with modern technology. Everaids Ltd was bought out of receivership by Everactive Ltd in 1991, and Dan had no further input into the development of the Turbo, although he has continued privately to support and service Everaids Turbos still in use. The later direct descendant of the Turbo was called the BobcatDX, and was supplied through Smile Rehab for some years. Dan, meanwhile, redeveloped his original idea into a new version, known as the Dragon, of which prototypes were made in 1995 by Pern Ltd and three of these were used regularly over the next ten years - one by Ruth. 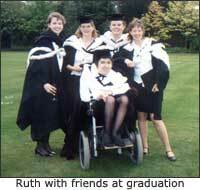 Ruth's Dragon carried her through GCSEs, A levels, a law degree and a postgraduate legal practice course. She is able to drive a car because of it. The other two users have also succeeded in gaining degrees. One now has a doctorate, and the other spent some time as a secondary school teacher. In July 2003 Ruth started testing modifications to the design which were critical to the Dragon Mark II, which became available in 2005. Eight years of continuous support and improvement of the three prototype Dragons had persuaded Dan to offer it more widely. The Dragon is mainly aimed at school age, teenage or lightweight adult users (up to 12 stone/75 kg), though it is useable by younger children. Dan's next project was to go back to the family's original mission and develop an even more compact version for pre-school children, called the SnapDragon. This power-chair is based on many of the component parts of the Dragon; it can even be upgraded to a Dragon if the user's growth should require it. Importantly, however, the size of the SnapDragon suits users down to twelve months of age without overwhelming them; the purpose being to "See the person, not the chair".